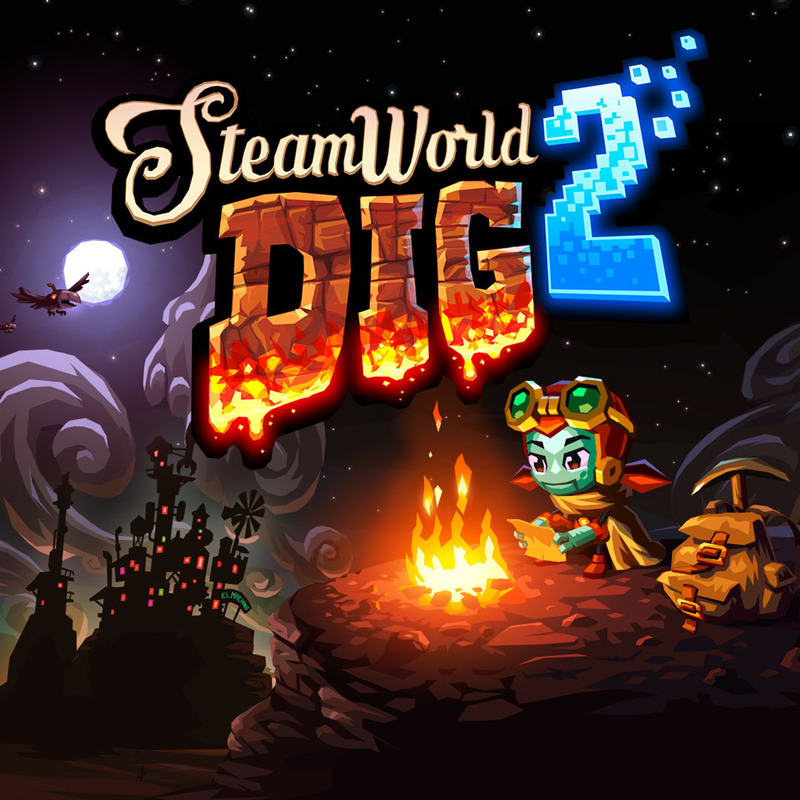 With SteamWorld Dig 2, Swedish based Image & Form wanted to expand on their SteamWorld universe, with a brand new sequel to the game that made them what they are, after a series of secondary games like SteamWorld Heist and more. And so the studio goes back to basis with a mix of action, exploration and mining platform game in 2D, which will rejoice fans of Metroidvanias and Mega Man X. Before I continue this review, I think it would be good to explain what the SteamWorld universe is all about, not? The action takes place in an imaginary post-apocalyptic world where time stopped at the beginning of the 20th century, in the height of Steampunk and Wild West, where robots known as “Steambots” have inherited the Earth. The few surviving humans are hidden in caves, overwhelmed by their creations’ powers and expansion. In the first SteamWorld Dig, players got to meet Rusty, a lonely Steambot miner on his way to discover an old mining town, Tumbleton. Well determined to get all the riches of the mine, the latter will soon discover mysterious things underground in his excavation that will alter his faith. In any case, If you have not played the first SteamWorld Dig, I’ll say no more, and plus it’s not really mandatory to have live the first adventure to get on this sequel. Now let’s talk about SteamWorld Dig 2, and our new protagonist, which this time is a “female” robot known as Dorothy, which players from the first game will remember, being the owner of a small shop that trades in Ores and Gems for cash. This time, she ditches the mantle of Ore and Gem buyer, and goes on to search for Rusty, which disappeared in the first game. She soon finds herself in the heat of the action by falling into a crevice that will allow her to meet Fen, a sort of electric companion for this adventure, that will also play a lead narrative role, and continue on to El Machino, a mining town and central hub of SteamWorld Dig 2. This mining town opens the doors to all the game zones of SteamWorld 2, and allows you to meet with the inhabitants, such as Mayor Mic Yonker who thinks only of making a profit, Barnacle Jones which will take over your ore in exchange for money, Turtle Bucker which will upgrade your gear, David Bittenborough who will spoil you with special equipment abilities in exchange for artifacts, and lots of other characters who will have a lot of things to tell us. As you leave the comfort of El Machino to venture into the mines below the town, you’ll first find rudimentary material, which nevertheless can be sold for money, and help you evolve to progress deeper into the abyss. The return journeys to El Machino, thanks to teleportation tubes will be frequent, to sell all your minerals and improve Dorothy’s tools and eventually new abilities throughout the game. Since I’ve been mentioning tools in SteamWorld Dig 2, I figure it’s time to explain what they are. Available from the beginning of the adventure, our heroine Dorothy will be equipped with a backpack (to store gems and minerals), a lamp and pickaxe. As you advance throughout the game, you’ll gain the ability to equip an armor, water tank to use pressure bomb, a sledgehammer, jet engine (or jet pack), grenade launcher, grappling hook, and hydraulic engine (to run). All can be improved eventually (except grapple and the running feature) in exchange for some money at Turtle Bucker’s workshop. Improvement with money range for each piece of equipment, such as the lantern lasting longer so you can see in the mines, more health when upgrading your armor, fit more gems when expanding your backpack and so on. It is also thanks to Turtle Bucker’s workshop that you can then setup your Cog Mods, to tweak your equipment even further, with approximately 60 different options available ranging from fall reduction, to faster water resupply, or even turn the game harder but more rewarding. There’s plenty to do as the developers allow the player to remove the Cog Mods as he wish, so he can activate another one. All the mods are obviously not available from the beginning of the game, and will require you to have certain upgrades of equipment or get blueprints from David Bittenborough. The developers have kept the best of the first SteamWorld Dig, in particular the gameplay, which certainly seems simplistic at first glance, as one just dig through dirt but it’s more than that. The various equipment mentioned above allows you to travel through the zones with a lot of variety, but above all to return to certain places which were then inaccessible during your first passage, such as when you get the jetpack or grappling hook. This little hint of Metroidvania makes things enjoyable, as we discover the different environments which are far more vast and varied than the first SteamWorld Dig 2, since the developers have abandoned the procedurally generated zones, for a more set world with lots of secret passages, shortcuts and riddles. You will understand that there is a lot to do in SteamWorld Dig 2 and I always take pleasure in digging any rock to discover all the secrets. On the technical point of view, Image & Form have done a great deal to boost their skills, with a colorful cartoon-ish design in this great steampunk and western world. The level design is also accompanied by an excellent soundtrack from El Huervo, one famously known for the frenetic soundtrack of a certain violent indie game: Hotline Miami. SteamWorld Dig 2 was reviewed using an Nintendo Switch downloadable code of the game provided by Image & Form. The game is also available on PlayStation 4, PlayStation Vita and PC in online store releases. We don’t discuss review scores with publishers or developers prior to the review being published. Whether you're a fan or not, you'll probably dig a lot SteamWorld Dig 2 (all puns intended). Full of challenges and hidden treasures to find, there's a lot more to do than the first game, which will last you for a decent 20 hours or more.